7 easy way to get free web traffic to your Blog - get the good traffic to your new blog or website. So in this, the article I'm going to tell you seven different tricks by which you can really get google traffic to your blog or website. Bringing traffic to your new blog or website is not a rocket science the thing you need to understand your blog or website is a new product and the way to make your blog reach is by marketing. I will give you promote blog tips which you can really increase your blog or website traffic. You can get a traffic from a google search. Tons of visitor every second search anything in google search engine. Some simple tips will make you an expert knowledge. You can call Off Page SEO. I wanna give you now Seven tips to get free visitor daily. Commenting Blog goes and searches for a website that nearly matches your niche and then just read out articles that have they written just one comment in their post. Like say Your article very informative and it was nice and I have two written a similar article like this do check this out and put your link Similar to that niche put in the link of your blog post. So the people who are reading that post would also be interested to read your post as well as you will get a good Quality of traffic. Youtube video give you huge kind of visitor goes to Youtube daily at once. So make a video your post related to finding out the peoples problem-related Topic. Make a video and upload in Youtube give a video description put in your blog post link so that peoples read that out and you also get a decent web traffic. Social Media Marketing Yes right you will get plenty of many social media network where you can publish or share your blog post content to get a social referral visitor. Social media like Facebook, Twitter, Pinterest, Google Plus, Reddit etc. Many articles now get a viral by the social media platform. Everything is free to try it out to share your content. Promote Your content in niche related forum. Many Forum available on the internet so you need to search your niche related forum. Make a content and put in your website link to promote your blog. Never Post off topic categories related forum. Your Blog regularly updates and post a 2-3per week. Most of the blogger has not updated their post-Post 3-4 times and give up posting where get lost many visitors. So that always be active in post content regularly. Active blog site google index regularly. Some of the Blog site you can Guest Post the content of an article of anything you can publish. Easily you can put in your blog site link to get a high-quality Backlink. Try to written your niche related content to make a backlink of your site. You will get a good amount of web traffic on your blog. Much important to rank your site in google you must need to make as more backlinks as you can. More Dofollow your post link or page link give a proper way to come traffic to your site. Build your site link in the high-authority website. Directory submits, Bookmarking, the guest post to get a dofollow backlink. 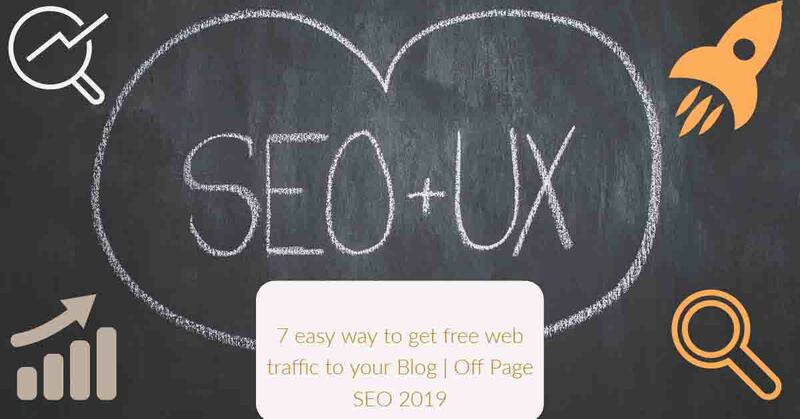 Promoting your blog post or page link 7 easy tricks in this "7 easy way to get free web traffic to your Blog | Off-Page SEO 2019" really make your promoting knowledge. Follow these easy 7 steps to get your website rank and get a good quality visitor daily. If you think this article really helpful to you then share this article to make know the other people as well.